John Oswalt concludes his acclaimed in-depth study on the book of Isaiah. Beginning with issues of authorship and composition, he presents a solid exposition of the Biblical texts, based on his intensive linguistic and historical research. 720 pages, from Eerdmans. - Publisher This long-anticipated work completes John Oswalt's two-volume commentary on the book of Isaiah. After opening with a valuable discussion on the state of Isaiah studies today, Oswalt provides an insightful verse-by-verse explanation of Isaiah 40-66, giving special attention to the message of the prophet not only for his own time but also for modern readers. 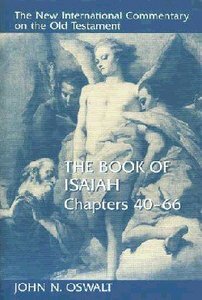 About "Book of Isaiah, the Chapters 40-66 (New International Commentary On The Old Testament Series)"
This long-anticipated work completes John Oswalt's two-volume commentary on the book of Isaiah. After opening with a valuable discussion on the state of Isaiah studies today, Oswalt provides an insightful verse-by-verse explanation of Isaiah 40-66, giving special attention to the message of the prophet not only for his own time but also for modern readers. Dr. John N. Oswalt (Ph.D., Brandeis University) is research professor of Old Testament at Wesley Biblical Seminary in Jackson, Mississippi. He is the author of numerous articles and several books, including the two-volumes Isaiah 1-39, Isaiah 40-66 (New International Commentary on the Old Testament series), Isaiah (NIV Application Commentary), Called to be Holy: A Biblical Perspective and most recently The Bible among the Myths: Unique Revelation or Just Ancient Literature?